It doesn't matter how many times I look at this image: I still find it stunning. I have a 3-foot by 3-foot version printed on canvas that hangs on my wall. What exactly is it, you may ask? 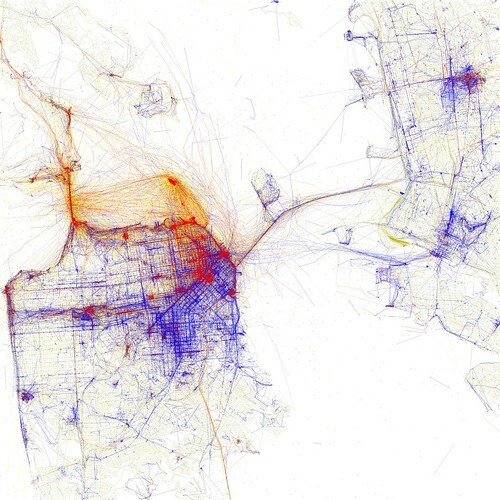 It's San Francisco, mapped by photo locations from Flickr and Picasa search APIs and then plotted on OpenStreetMap. Those posting photos in a given city for more than a month are considered local (blue); those posting in the given city for less than a month who appear to be residents of another city based on their posting are considered tourists (red). Yellow designates those not fitting into either category (likely but not conclusively tourists). Lines connect places where the same person took two pictures within ten minutes of each other. It's simultaneous art and information discovery. The expected places are red: Golden Gate, Alcatrez, Fisherman's Wharf. But there are some places I hadn't realized were so frequented by tourists until I studied this infographic: twin peaks, AT&T stadium, Berkeley. Makes sense, just not something I would have known before seeing the data. This piece is part of a collection (currently made up of 135 cities) called Locals and Tourists by Eric Fischer. Take a look, find your favorite city, and see what you can learn! You know that when even your recently-graduated-from-college brother is talking about a TED talk on data visualization that it's going to be good. It's taken me an embarrassingly long time to watch this. But I'm glad that I finally did. Aaron Koblin's flight patterns visual is breathtaking to watch by itself; hearing his description of the project and what jumps out to him in the resulting visual is intriguing. His other projects are equally engaging. I believe also that this is good demonstration of the value of narration on motion graphics - the context that would otherwise be missing is often what makes the visual truly compelling. The burst in Amsterdam text traffic wouldn't mean as much if you didn't know it was new years. Also, who knew collecting drawn sheep could be so interesting? Guess you'll have to watch (if you haven't already) to find out what I'm talking about. Nat, if you're reading this - you'll enjoy Le Petit Prince reference.